Hi guys, at present time billion of users send or receive daily lot of messages to each other. They send or receive messages either from his Android Smartphone or from Email account. Android Smartphone and Email accounts are the best way from which you can easily send or receive instant messages to each other. But lot of time you must face duplicate contacts or email problems. And you have to check or justify which contacts is actual and which is duplicate. It is so difficult so, today we have to discuss how to find and remove duplicate contacts from Gmail account. If you want to add any person his your contacts list, then you must store his name, number, address, email id and other things. But most of the time we store these information lot of time of a particular person. And it is very difficult to find out which one is unique or duplicate. Most of the person store duplicate contact number in his Android Smartphone or his email account. First of all we must have to know how to add any contact in your Gmail account. Step 1: Open your registered Gmail account. Step 2: After opening your Gmail account take mouse pointer on top left corner and choose Contacts option at the place of Gmail from drop down list. Step 3: Click on Add new contact button which is placed at the bottom right corner of Gmail Contact box. Type the name, add photo, contact number, email id, dob, and many other things as per your need. Step 4: Finally, click on the Save button to store your new contact information. Step 1: Open your registered account from which you to find and remove duplicate contacts from Gmail account. Step 3: Click on the “Find duplicates” option which is placed in the extreme left pan of your contacts list. Step 4: Gmail account automatically shows duplicate contacts one by one. If you want to merge duplicate contact then click on the “Merge” button. If you want to dismiss duplicate contacts then click on the “Dismiss” button. After dismiss any contact you can easily reverse back by clicking on the “Undo” button. Step 5: If you want to remove any duplicate contact then click on the contact. Click on the three dot button and choose “Delete” option to immediately remove duplicate contact from your contacts list. I hope you like how to find and remove duplicate contacts from Gmail account tips and tricks article. 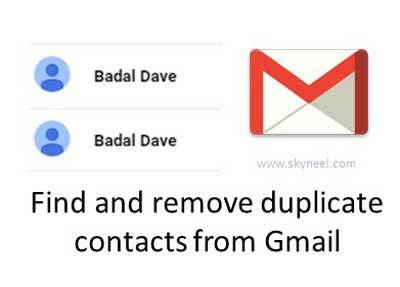 After reading this article you can easily search or find and remove duplicate contacts from Gmail account. This tip not reduce your working time and also manage your contacts list. Kindly give your important suggestion regarding this article in the comment box. Share your knowledge with your friends, family members and others. Thanks to all.